A visit to the chateau Vaux le Vicomte, built in the 17th century (1658-1661) for Nicholas Fouquet, finance minister of Louis IV. The architect le Vau, the landscape architect Le Nôtre, and the interior designer Le Brun worked together on the project. The project and the parties held there were so lavish that Fouquet was accused of using state funds. He was arrested after a particularly lavish party and imprisoned for life. 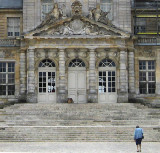 The team who worked on the chateau went on to build Versailles for Louis IV.